These “bawls” were intended to float in a most delicious chicken broth, but it turns out they were destined instead for this mid-week meatball sandwich. 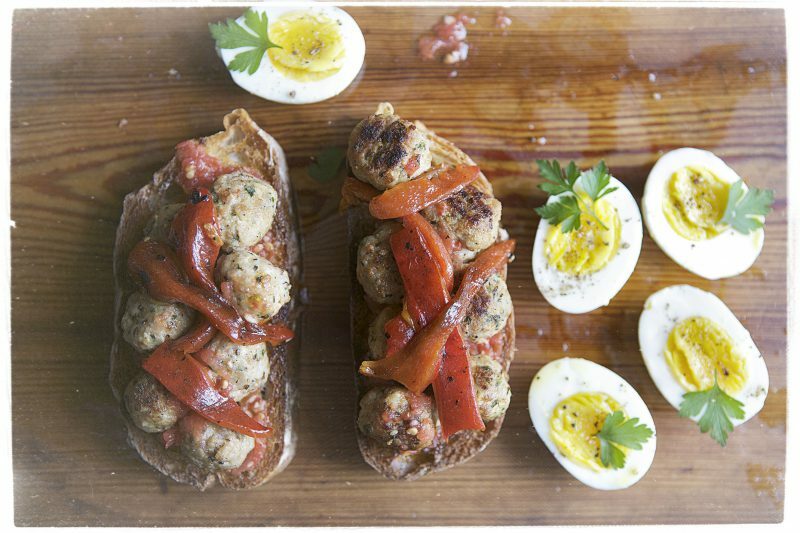 We made pan con tomate, piled on the delicate meatballs, then topped them with roasted peppers. We gilded the lily, adding hard-cooked eggs drizzled with olive oil and sprinkled with salt and pepper. 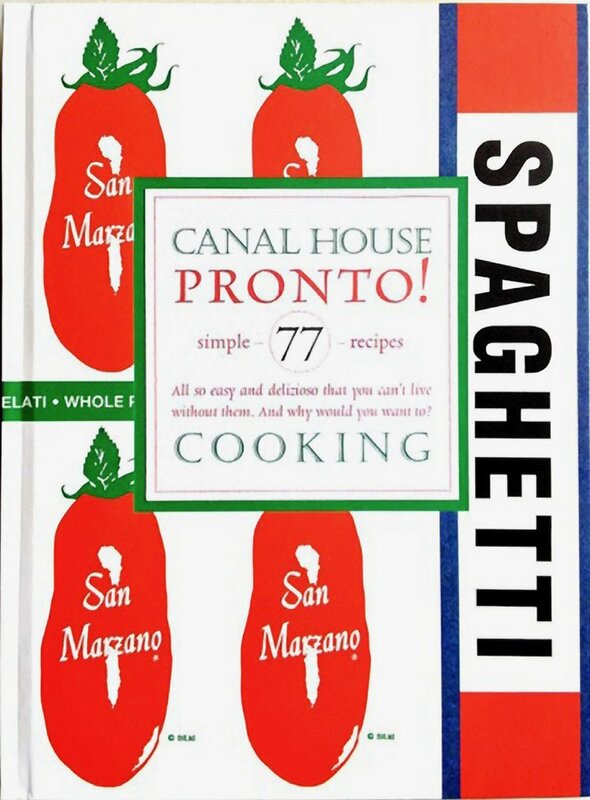 We ate off paper plates, sitting on the edge of the canal dangling our legs above the water—it’s summertime. We’ve just returned from Seattle, or as we like to call it, the northern Enchanted Valley. The markets and restaurants were full of spring flowers, berries, ripe tomatoes, English peas, tiny Pacific Northwest oysters, good chewy loaves of bread with burnt crusts, bottles of rosé and pinot noirs. We thought it would be hard to return to the rainy East Coast. But at our little farm market at the end of town, we found baby carrots, fresh peas, Jersey asparagus, and small bulbs of fennel. 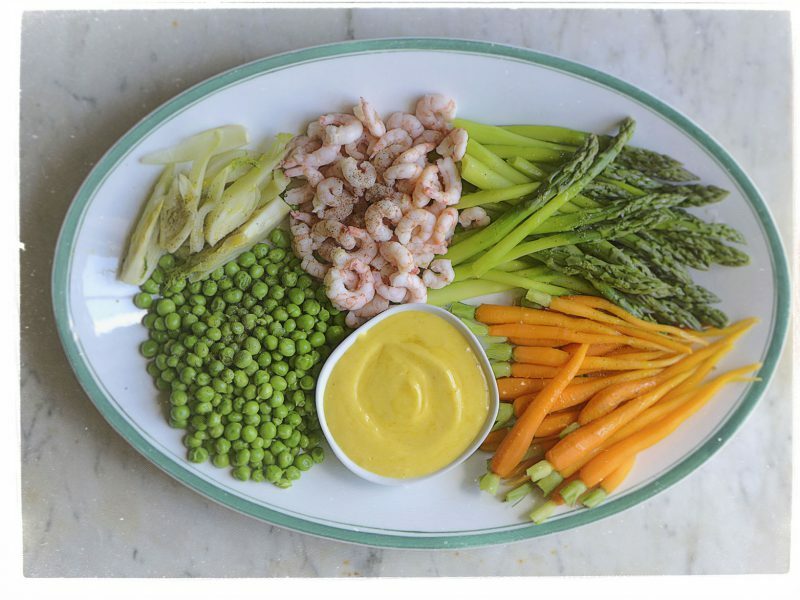 We defrosted a bag of sweet Maine shrimp from the freezer, and gave them a quick blanch like we did with the vegetables. We pulled it all together with a lemony butter sauce. The sun poked its head out of the clouds this afternoon. Things are not so bad in our enchanted river valley! Have a delicious weekend, dear friends. Oh dear, strawberries again? Since we have been waiting all winter for these scarlet beauties, we just can’t stop. 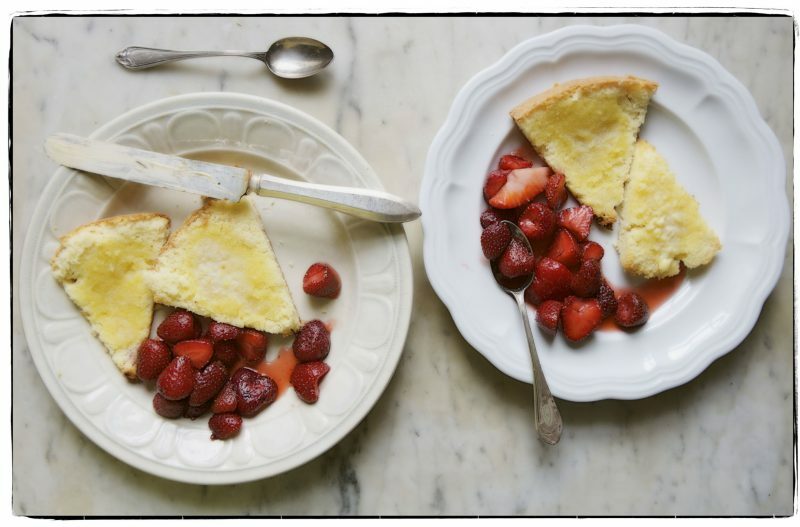 We made a tender shortcake, slathered it with good salty Irish butter, and served it with sweet, sugared berries. We don’t cotton much to the word “brunch”—it conjures up mimosas, and why would you ever want to ruin good Champagne with OJ—but it certainly was a breakfast-lunch. And damn good. We’ll have a glass of cold bubbly at the end of the day. Lettuce is arriving by the bagful at our door—the kindness of neighbors. 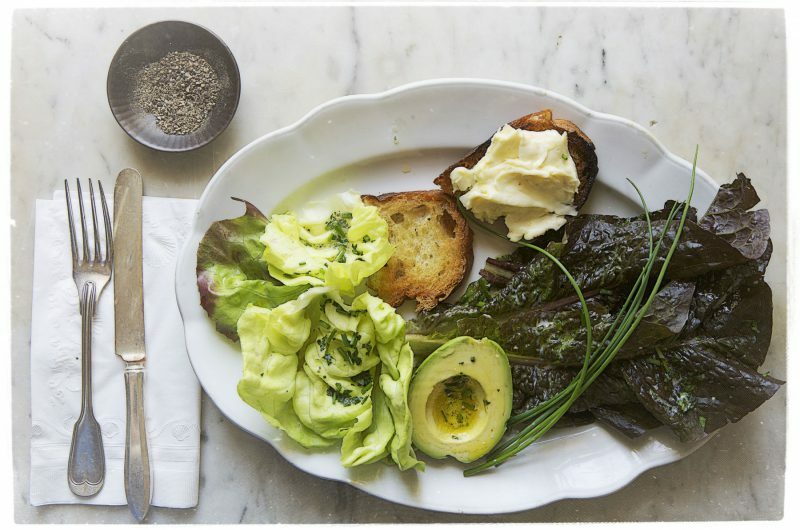 So it’s simply dressed leaves, along with an avocado and a big smear of perfectly ripe brie on toast (to add some real calories) for lunch on this downright perfect late spring day. This morning, the big sign in front of Homestead Farm Market on the edge of town announced “Local Strawberries!”. So, of course, we picked up several quarts—who could resist and why would you? We had big plans of slathering toasted bread with butter, adding spoonfuls of fresh ricotta, then piling on sugared berries. 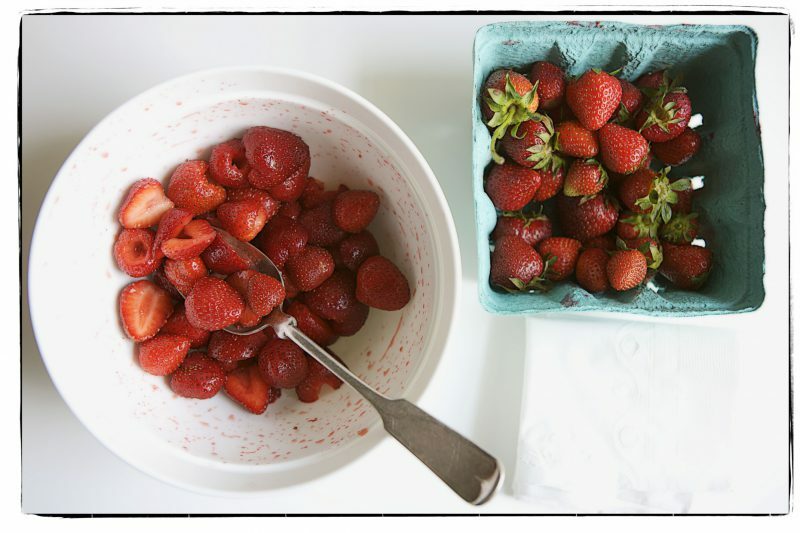 We never made it past sugaring the berries—we just devoured the whole bowlful. We’ll save the fancy treatment for when we aren’t so berry-deprived.